I visited the 9/11 Museum last December. It has taken me until now to want to post my photos. It seems fitting, on this 14th anniversary of that horrific day. Entrance Hall to Concourse Lobby and the beginning of the exhibition. This is the tableau that begins the journey into the museum. 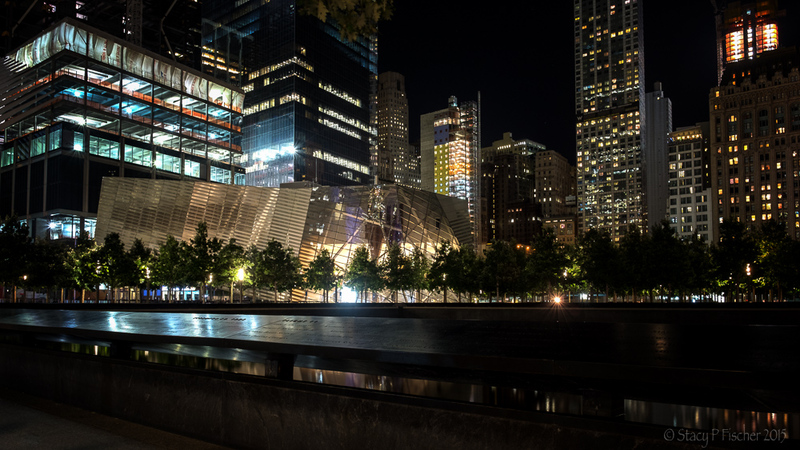 On the left stands the World Trade Center tridents, a signature architectural element from the base of the Twin Towers, which were once part of the facade of the South Tower. The juxtaposition of the photograph and the tridents is a sobering reminder of what happened and of what lies ahead in the exhibit. The tridents, with Freedom Tower as the backdrop. 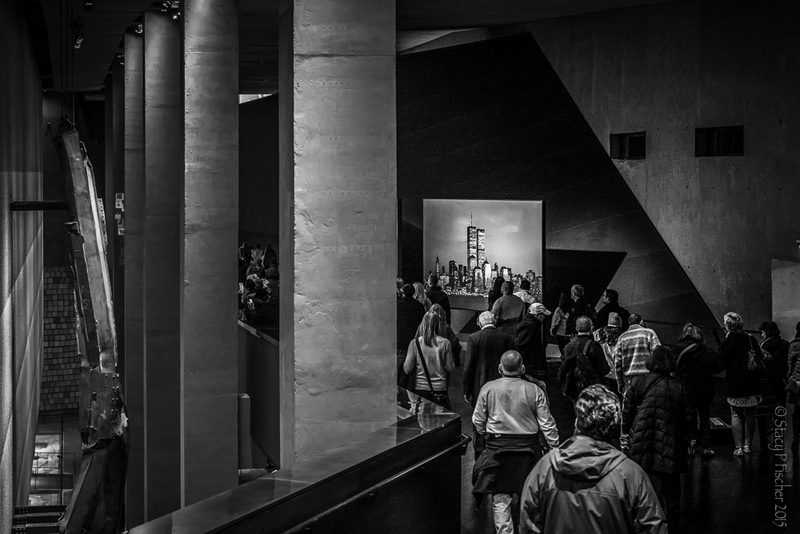 From the Concourse Lobby, visitors are directed to the Ramp, which begins with a soundscape of voices of people remembering their experiences of 9/11. The end of the Ramp overlooks Memorial Hall and the soaring Trying to Remember the Color of the Sky on That September Morning. This artistic installation, created by Spencer Finch (American, b. 1962), is composed of 2,983 individual watercolor drawings commemorating the individuals killed in the attacks of September 11, 2001 and February 26, 1993. Each square is a unique shade of blue, and each is a distinct attempt by the artist to remember the blue of the sky on the morning of September 11. 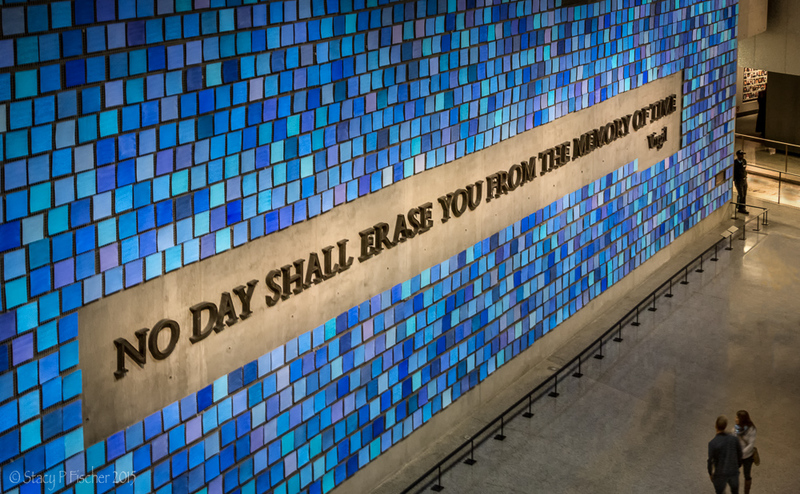 The quote, “No day shall erase you from the memory of time,” comes from Book XI of Virgil’s The Aeneid. New Mexico artist Tom Joyce (American, b. 1956) forged each of the letters from pieces of recovered World Trade Center steel. An escalator descends from the Ramp to Memorial Hall, the original foundation level of the Twin Towers and the exhibitions. Straight ahead from the escalator is Tribute Walk. 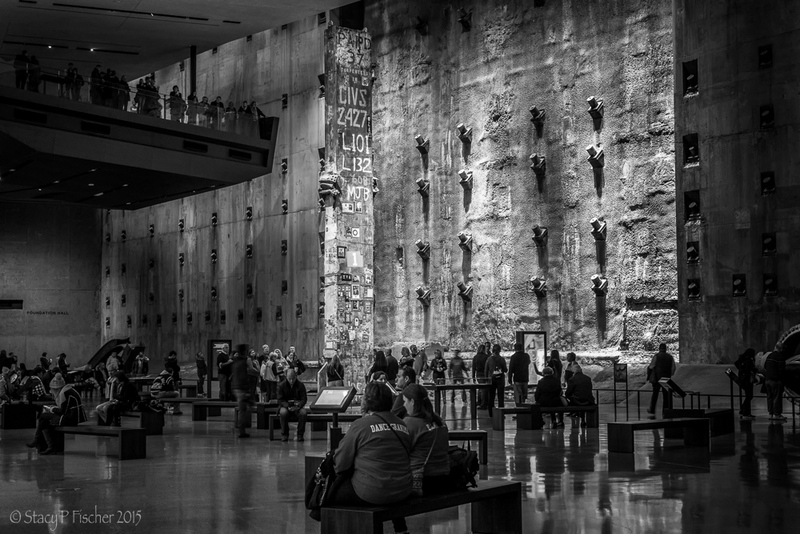 Displayed along the walls of the Walk are different artistic expressions created in response to 9/11. Difficult to see because of camera blur, the piece at the end of the walk is not artistic. 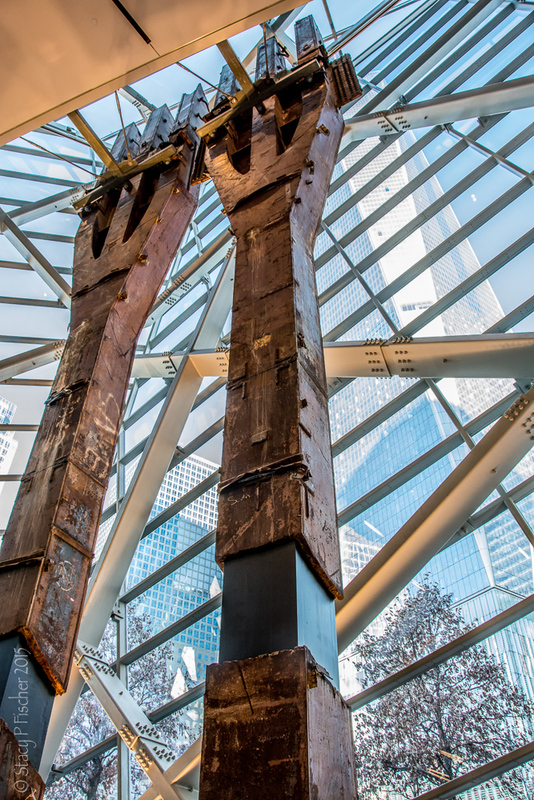 It is instead impact steel, a portion of the North Tower facade from floors 96 through 99 that was twisted by the direct hit from American Airlines Flight 11. 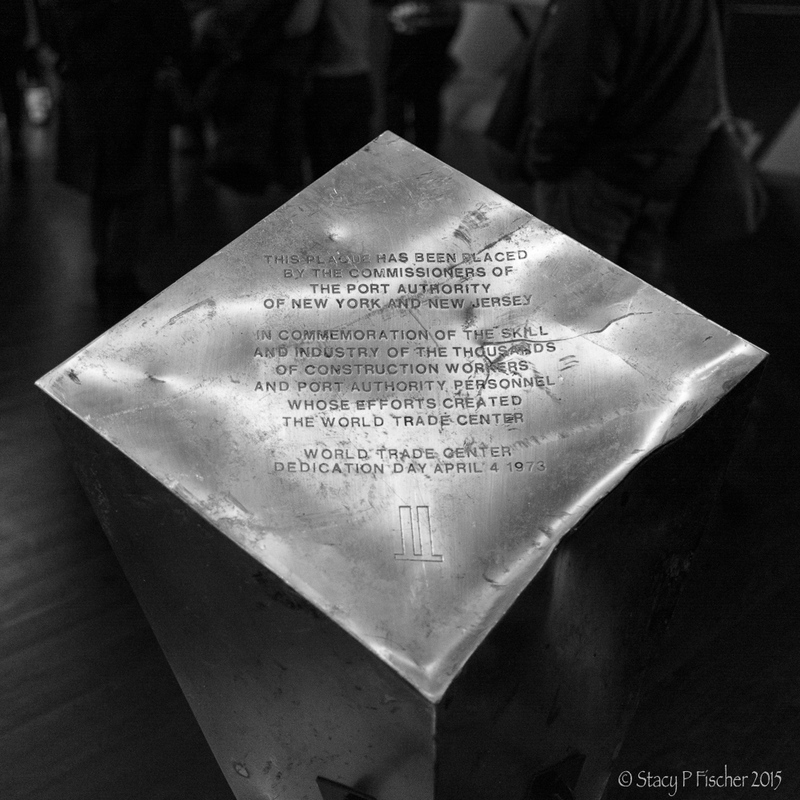 A companion piece of impact steel from floors 96 through 99 is displayed in the South Tower Excavation. The fenced and lit area to the left exhibits remnants of the columns that supported the South Tower and marks the excavated portion of the tower’s perimeter. To the left of the columns is one of a few entrances to In Memoriam, a quiet space where visitors can honor the victims of 9/11 and 2/26/93. Individual portraits comprise the “Wall of Faces,” and touchscreen tables provide additional information about each person. An inner chamber lies within In Memoriam where profiles of individual victims are displayed via photographs and audio clips. This was one of the most emotionally difficult parts of the Museum for me. Even had cameras been allowed, I would not have used mine. The “slurry wall” is basically a 7-story dam built to hold back water from the adjacent Hudson River. It enabled the excavation of the site for and building of the Twin Towers’ foundations. Damage to the wall and subsequent flooding of the site was of great concern in the aftermath of the attacks. Not only would flooding hamper rescue efforts, but other below-grade structures, like the PATH tubes and subway tunnels, could flood. The design of this wall helped to prevent flooding of parts of lower Manhattan. The Last Column against the background of the slurry wall. The Last Column was the final piece of the World Trade Center left standing and the last artifact removed from Ground Zero. It is a fragment of one of the 47 steel beams running from bedrock to the roof that held up the South Tower. 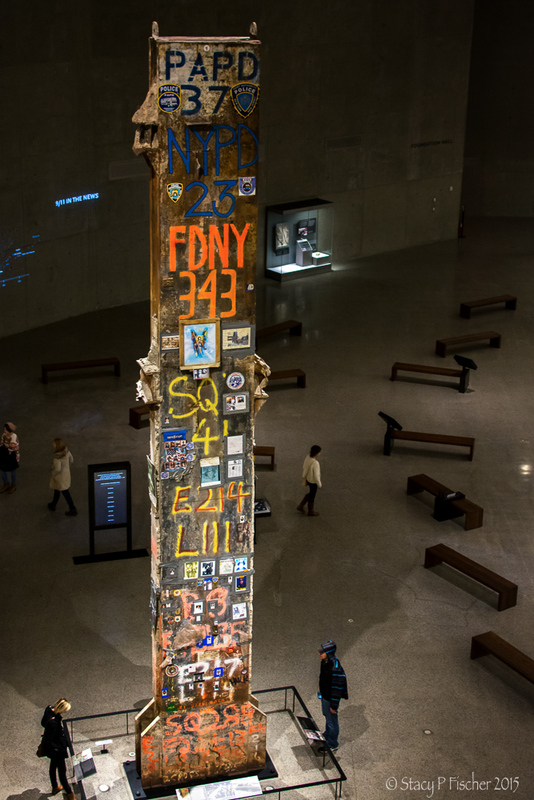 Standing approximately 36 feet tall, it became a marker among the rubble of the last known location of many first responders who were killed in the lobby of the South Tower and a makeshift memorial, plastered with mass cards, photos, and engine company and police precinct insignias. “PAPD 37,” at the very top, is the number of Port Authority cops lost; “NYPD 23” and “FDNY 343” pay tribute to police and firefighters who gave their lives. 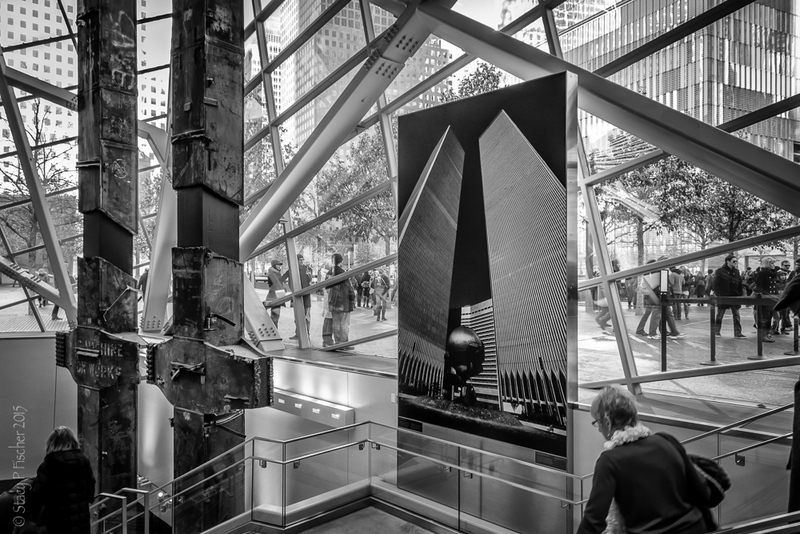 Shrouded in black, draped with an American flag (the honor given to all 9/11 victims who were recovered), with bagpipers playing “Amazing Grace,” this Last Column was removed from the World Trade Center site on May 30, 2002, marking the end of the nine-month recovery effect, which finished ahead of schedule and on budget. Entered via glass doors, the main historical exhibition is an enclosed area located within the footprint of the North Tower. Exhibits and artifacts chronicle the events of September 11, the events leading up to 9/11, and the aftermath of 9/11 to the present day. No cameras or recording devices are permitted. Exiting the exhibit area, visitors are once more taken past the World Trade Center tridents. Emotionally spent from all I had seen, I was not at all prepared for the haunting tune of Amazing Grace playing softly in the background. 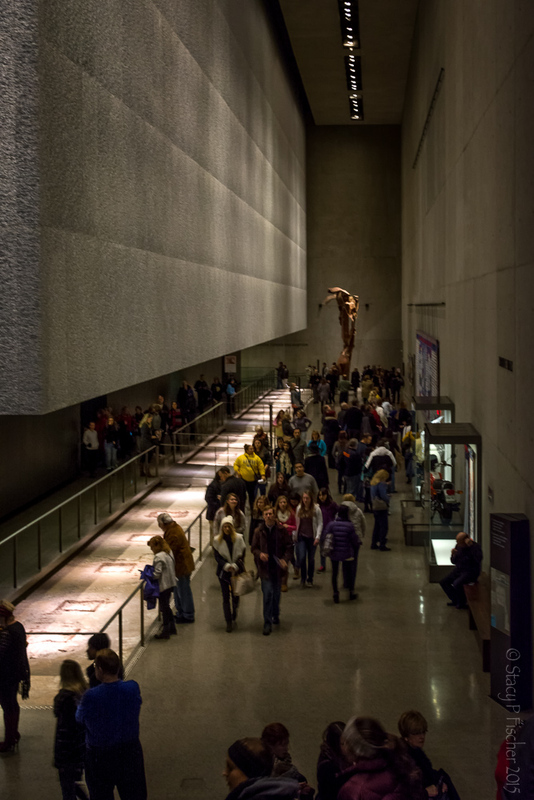 From beginning to end, the 9/11 Memorial Museum is a poignant and powerful reminder of that fateful day and all that followed and changed as a result. Above all, it is an amazing tribute to those who lost their lives, to those who worked so tirelessly to recover and rebuild, to the resilience of the human spirit, and to the triumph of good over evil. It is a visit I will forever remember. The Museum, aglow with lights. Look closely and you can see the Tridents within, on the right. This entry was posted in New York City, Places and tagged 9/11, Manhattan, memorial, memoriam, museum, photography, postaday, World Trade Center. Bookmark the permalink. A wonderful tribute in words and photography to that day that we will forever remember. I appreciate your kind comment, Marje. Thanks so much. There are no words…my brother was involved in the building of the towers. I know it broke his heart to see them both come down. Oh, I can only imagine… Thanks so much for leaving your comment. Marsha, as much as I tried to convey the experience, my words don’t do it justice. It’s something that needs to be experienced first hand to truly feel its impact. Though difficult to visit, I’m glad I did. Thanks so much for your comment. Stacy, I can feel your emotion, in the images and your words. My friend Ruth and I stopped at the Flight 93 Memorial site on the way home from the VT game in Pittsburgh last year. We arrived too late and the Park Service Rangers were closing for the day. We listened to the audio tour as we drove away from the site, and even that was powerful and devastating. Laurie, I can only imagine. I tried to visit the Pentagon memorial this summer, but had difficulty finding someplace I could legally park. I do remember going down to a hill overlooking the site a few days after it happened, just needing to connect with others who were there. I sat next to a young man who, like me, couldn’t hold back the tears. We turned and looked at one another and then just hugged … and hugged … and cried some more. It is another memory of that time I will always remember. Thanks for sharing. 9/11 is one of those days all of us can recall where we were and what we were doing. I still find it difficult to watch documentaries of the day. Stacy, I think I would be a puddle of sadness and grief walking through as you did. Thanks for sharing your amazing pictures and perspectives of the 9/11 memorial. You’ve honored it beautifully. Thanks so much, Alys. I was an emotional wreck once I emerged, and I hadn’t even seen all that there was to see. I’m torn whether to revisit, but I’m glad I did see it at least once. Difficult, but it also left me with a feeling of pride for New Yorkers, specifically, and America, as a whole. Such resilience, strength, and bravery. How I wish that that patriotism and kindness to our fellow man was an every day occurrence, not something spurred by horrific acts of others. I remember the sky, as I watched on the TV, live that day, was a rich pale blue and clear. Over the last couple of days I have watched some wonderful documentaries made in 2008 from video footage taken by ordinary citizens and others. 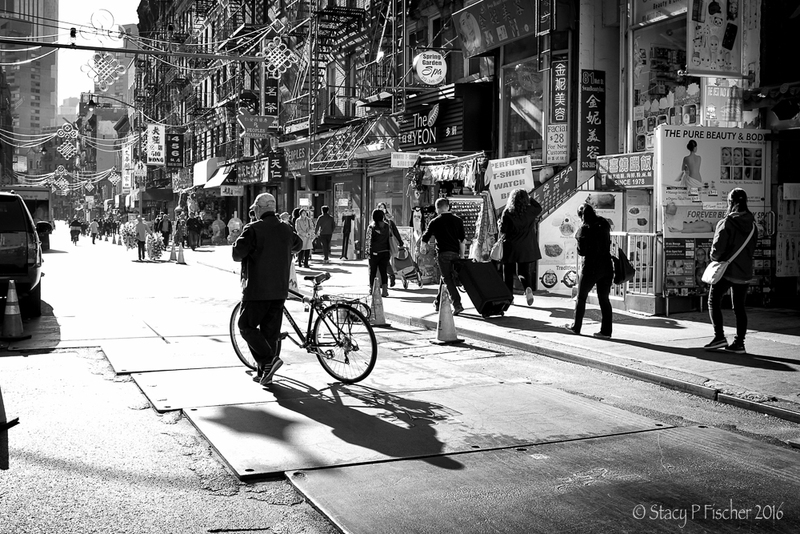 I felt I was there and had an indelible sense of what it must have been like there, that day. Janina, thanks so much for your comment. I, too, shed a number of tears as I composed the post, doing my best to do justice to what I had seen and what I experienced emotionally. It’s strange how many people remark on the sky – I had not yet left my house that morning, and upon hearing the news, sat glued to my tv for the remainder of the day – but Finch’s installation just took my breath away. I would imagine that documentary is very powerful. Was this aired on tv? Yes, Stacy, those 2008 documentaries were shown on local TV. On 9/11, we too were watching it all day on the TV and gasping further as things got worse, the Pentagon etc. Any memorial like this of course is more moving when seeing it in person. Wonderful tribute Stacy. I think we can all remember where we were when we first heard this terrible news. Your images are powerful and we should never ever forget. Thank you! I had a day off that day and was listening to the radio and it took me awhile for it to sink into my head what I was hearing. Then I ran downstairs and turned on the news. Thank you- your photos are wonderful. I went to the museum last year. It was hard but worth it. I will never forget. Colette, I see my big sister has spread the word about my post. She’s such a wonderful cheerleader. It is definitely a difficult museum to visit, akin to the Holocaust Museum in DC, but as you say, worth it. Thanks so very much for commenting. Very powerful images eliciting some very powerful emotions. It was difficult to visit and difficult to write about, Emilio. I didn’t have a chance to see everything. Perhaps someday I’ll return. I had a friend who worked there but she didn’t go in to work that day. She is now married and has a kid. Excellent Stacy! Moving, awe inspiring, and simply stunning work! Thanks very much, Robyn. Have you ever been? Thank you for sharing your images and your thoughts on your visit today. I almost visited the memorial museum earlier in the year but I didn’t feel able to. One day I absolutely will. As difficult as it is, Laura, it’s something I highly recommend. Thanks so much for your comment. What to say . . . . .
A lovely, lovely tribute Stacy for a moment in time so horribly incredulous. Thanks very much, Joanne. It was time to finally do something with the photos and share information about this incredible museum. Such beautiful, moving words and pictures. A very fitting tribute. Thanks so much, Katie. The most difficult parts of the museum are, of course, off limits to cameras (as they should be), but even writing about experiencing these other areas gives you a taste of how well thought out the plan and how respectful a project the museum is. I bet this experience is something that will stay with you for ever. A beautiful and moving tribute Stacy, brought tears to my eyes.